When a LED luminaire is first energized, a variable current is required during the first milliseconds, and then the current stabilizes as soon as rated operating conditions are reached. Three transient fundamental events occur during the start up phase: the power supply of the luminaire, the start of the driver, and the powering of the LED module (that is to say when the light is on). Then the luminaire transitions to the steady state operating condition. During the switching on, a peak of very significant inrush current occurs before 10 milliseconds. At that very moment circuit breakers can trip; this happens very often. Normative curves used for circuit-breaker certifications (the “standard” curves defined by NF EN 60898 and NF EN 61947-2) characterize fault currents of a duration exceeding 10 ms, and thus correspond to the circuit breakers’ tripping threshold for currents maintained for 10 ms or more. 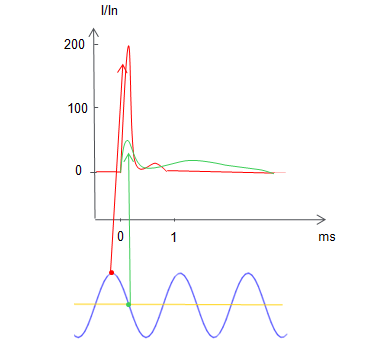 For transient currents of duration less than 10 ms, no normalized curve exists! In other words, the LED technology can make your installations trip by nature! For circuits with more than 20 LED luminaires, the reliability during the switching on remains very uncertain; the tripping is random. 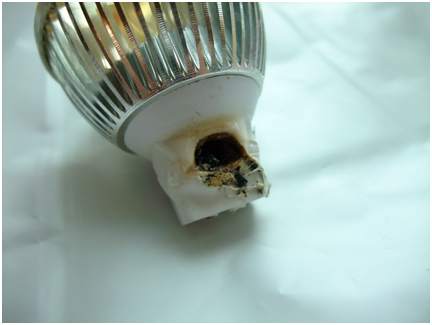 LED-technology luminaires contain electronic components, which make them very sensitive to surges, which can damage or even destroy the power supply drivers and LED components. This high sensitivity to lightning surges can considerably reduce the LED luminaires’ theoretical lifetime. These feedbacks about LED technology being neither reliable, nor economical, are highly disturbing. This made us decide to raise this alert. Moreover, these issues seem to be “hidden” due to lobbying. Here, at the Electrical Engineering Community, we decided to investigate these phenomena. As a matter of fact, we’re wondering if they are isolated cases or if, on the contrary, these issues are really observed by everybody. Have you ever noticed one of these issues? If you have, in which context was it? Did you find solutions to countervail them? Let’s share our experiences and let’s investigate together. We thank you all in advance for your answers, because helping us means helping all the electrical community and thus yourselves. We’ve decided to create an area to take an inventory of all the resources about these issues. And that’s not all: we also plan to share resources about the solutions to apply. These are laboratory-tested by several teams of professionals. To receive the username and password to access to this LED resources area, simply send us an email and give details about the issues that you’ve noticed in the installations with LED luminaires. And if you never had any issue, please tell us too; every information is worth taking! PS: Those who’ve already sent us details about the issues that they noticed will automatically receive the username and password to access to the resources area. or copy this trackback: http://engineering.electrical-equipment.org/energy-efficiency-lighting/using-led-global-alert.html/trackback from your own site. With regards to the overvoltage, overcurrent and random tripping, i haven’t seen this effects. Neither i haven’t had problems with surges. But maybe is important to request to the manufacturers more technical information related to the inrush current and withstand voltage of its products. In other hand, i have had problems with electromagnetic compatibility EMC between LED Drivers and suceptible equipments in medical installations. The LED Drivers were producing radiated and conducted interference in an echograph connected through an dedicated UPS. Parcial solutions has been achieved with the use of metallic conduit and total shielding of the feeder of the equipment, but it hasn’t been enough. I am trying to specify an emc filer for the conducted radiation. I have measured power, rated current and Harmonic content of different Led lamp ( between 8 W and 25 W) The surprise was the spread of THDI, from 25% to 150 %. The THDI should be request to manufactrurer as guaranteed data. I`m sure this has a deep impact in EMC and EMI interference due to the different drivers used. I’ve read Jason’s commented. Neither did I have any problems with surges or overvoltage and random tripping. What I did find that some LED drivers are interfering with two radio signals. When the Led lights are off, you have clear and perfect radio signals and coms, but as so as you switched on the site office LED Lights the radio signals get scrambled with weak coms. All my office’s PC monitors are changed with new ones. These new ones have the same problem you mentioned. Radio comms interference. When monitor alone is switched off the comms are functioning fine. Radio Comms getting scrambled when monitor is ON. So the problem might be with the LED backlight of monitor. We have a couple of LED’s which illuminates an external commercial Signboard. In the middle of the night, the dedicated 20 Amp single pole breaker trips all the way.The actual recorded current is 12 amps ( logo + name signboard ) the only successful solution is separation of circuits for Logo and Name connected to separate circuit breaker. Nice, you managed to find a solution ! And were you able to separate the circuits easily ? I had the same problem and I’m still looking for a conveninent solution…! I haven’t heard about this problem before with LED lighting. The issue of nuisance tripping appears to be caused by too many LED units coming on at the same time. As mentioned, splitting the circuits through multiple breakers helps. You could also split into different ‘start’ zones with multiple timeclocks, or install time delay relays for portions of the circuit so they start in a staggered method. This approach works well in other applications, such as mutliple motors or chiller plant equipment. Have been using LED Lights since long. Have not experienced the tripping. Awaiting commissioning of one ongoing project where LED has been used heavily to comply Sustainability norms of the project. i have been using LED but i can confess that i do not know whether it has some benefit like this………. I bought 1 LED bulb 5 W a months ago then one time i noticed @ 6:00 pm (peak hour) when i switch it on the bulb is keep on flickering i switch it off after 2 min. when i turn it back the same thing happened.The next day it back to normal. In some electrical installations of customers, I have measured high level of flickers, Pst and Plt. When I checked what were the main loads, the majority of them have installed LED Lamps. I have measured level over 2.6 . This level of flickers I have seen in steel plants where they have EAF (high voltage electric arc furnaces). I am not sure about the correlation, but always I see the presence of harmonics and flickers. As everybody knows, LED lamps, will inject harmonics but looks to me that will affect the voltage in the form of flickers. For one of my clients , we installed LED lamps to cut down energy consumption, but we couldn’t find remarkable saving in energy even after 0ne year of installation.